With a growing number of environmental regulations and the increasing demands for higher efficiency and lighter weight, more and more composite materials have been used in various industrial fields such as automotive, aerospace, wind power and energy industries. A composite material is combined materials of two or more kinds for better machining properties. Typical examples are CFRP(1) consisting of carbon fiber and resin, and GFRP(2) consisting of glass fiber and resin. They are light and have excellent mechanical properties featuring strong resistance to corrosion and fatigue. Unlike general metals, CFRP and GFRP generate large amounts of chips in the form of scraps. Due to the high hardness and low thermal conductivity of the fiber-reinforced materials, high-temp cutting heat is generated during machining and tools wear out rapidly. In addition, their high strength, high elastic modulus, and inhomogeneity between dissimilar materials cause excessive vibrations, and the composite structures cause machining troubles such as delamination, splintering and burrs. KORLOY’s diamond-coated grade ND2100 features a nano-crystalline diamond coating that has strong resistance to wear and friction, resulting in outstanding tool life. CCDR is a dual-helix-type finishing endmill, which is designed to inhibit flaking from upper and lower faces of workpieces in compression cutting, so that high quality contouring and slotting can be achieved with excellent surface finish. 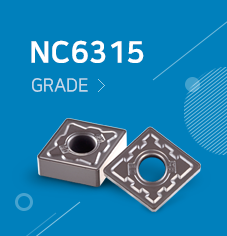 CCR is a roughing endmill with down-cut blade design of low vibrations and low cutting resistance, which is suitable for contouring, slotting and parting off thin sheet metals. CCLR/CCRR are low-helix-type finishing endmills with low axial cutting resistance that inhibits fiber tears and burrs, excelling in contouring and slotting with superior surface finish.